Sitting majestically atop a mountain in the Upper Galilee region of Israel, Safed provides its residents with breathtaking views and clean mountain air. This setting, along with the city's quaint alleyways, stone buildings, blue painted doorways and its tradition as a mystical city, has attracted artists from all over Israel and the world and has created somewhat of an artist colony in the heart of the city's Old City. Our contributors have been hard at work getting to know and profiling Safed's many creative artists so that you can discover the artistic side of Safed and seek out the artists whose abilities most interest you. As Safed is known throughout the world as the city of Kabbalah, it is only logical that there are many artists located there who devote their creative energy towards art influenced by this mystical religious text. One of the most well-known Kabbalah artists in Safed is Avraham Lowenthal who immigrated to Israel from the United States after becoming influenced by the Kabbalah. All of his work has Kabbalistic meaning and is for sale in his studio. Other Kabbalistic artists in Safed are David Friedman and Yaakov Kashamacher, who is a mystical and kabalistic mixed media artist. Check out our articles about their work and find out more about how the Kabbalah influences the artistic ability. If you are ready for a break from the Kabbalah theme, then check out some of Safed's other local artists. 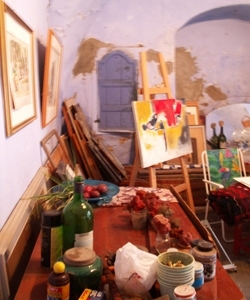 You can visit artists in their galleries across town. Check out Cana'an Weavers, a studio where you can purchase hand-woven Judaica; Daniel Flatauer, a local Safed potter; Moshe Chaim Gress, a wax worker; Moshe Porat, a sculptor; or Mike Leaf, a paper mache sculpture. Also check out our articles on Myra Mandel, Yonatan Darmon, Noah Greenberg, Gabi Cohen, Andy Alpern, Reli Wasser, Sheva Chaya, Anna Kheifetz, Haim Azuz, Masha Orlovich, Miriam Mehadipur, Sarit Rubin, Ruth Shany, Jan Menses, Victor Halvani, Yuval Yisrael, Robert Rosenberg, Lenoid Zikeev, Binyamin Shalev. You can spend days wandering through this art-inspiring city and viewing the works of Safed's many artists and creative souls. Check out our special profiles and see which artist inspires your creative aspirations. For a listing of galleries in Safed, click here.